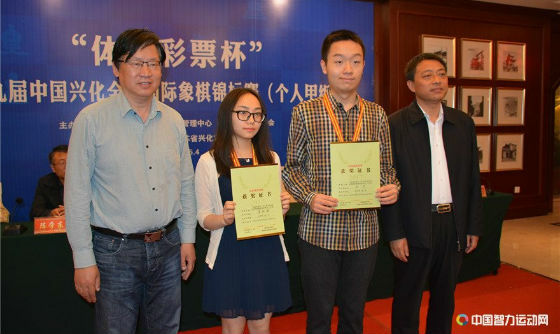 The 2017 Chess Championships of China for men and women were held from 23rd April to 4th May in Xinghua Jiangsu China. Both events were 12-player round robins. In each section four players singled out on the top leaving the rest of respective fields far behind. In the men’s championship the top seed Wei Yi emerged champion with 8,5 points. Trailing by half a point are Wen Yang and former world junior champion Lu Shanglei. After Zhou Jianchao on 7,5 points, there is a huge gap of 2 points before the next group of followers. In the women’s championship Lei Tingjie edged the reigning world champion Tan Zhongyi to claim the national title with 9/11 points. Wang Jue and Tan Zhongyi are half a point behind, while former world junior champion Guo Qi landed on 8 points. The chasing pack is on 5,5 points.